Janine Robinson, Founder of Essay Hell. Social Media Links: Facebook, Twitter and Tumblr. To start off with a more career-oriented question, how did you get into the business of helping students write their college essays? When my daughter was a junior in high school in 2008, I helped her brainstorm topics for her college essays—both for the University of California and The Common App. When I saw that these essays were best when written in a narrative (story-telling) style, I realized that my background as a journalist, writer/editor and English teacher almost perfectly prepared me to help her. So I started helping other students in my hometown of Laguna Beach, California. And it kind of took off from there. 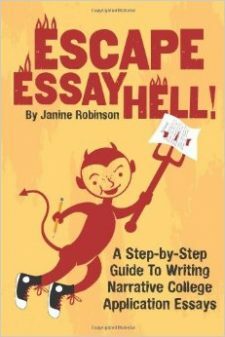 I also started my blog, Essay Hell, and published essay-writing guide books. In journalism, especially magazine feature writing, we often use anecdotes (mini-stories) to start off articles, which grab the reader and also illustrate the larger points or themes with colorful, engaging writing. These also work like a dream in college app essays! In my professional writing, I also use other fiction-writing techniques, such as dialogue, sensory details, metaphors and descriptive language to bring the articles to life. When I saw how most college application essays were too formal and academic in style and tone—and often plain boring–I helped my students use these same techniques to make their essays lively and compelling. What are the most common and flat-out myths you’ve heard regarding college essays? The worst one is that you need to impress the reader with some “wow” type of achievement or accomplishment. It’s actually the opposite: Often the most everyday topics make the best essays–riding the public bus, having freckles, loving karaoke, making crepes, learning to drive a stick shift, getting stuck in a tree, etc. It’s counter intuitive, but mundane topics work almost every time. Seriously, do you want to read about someone’s Eagle Scout award or the time they won the league championship? Not me. Many students believe their essays need to sound serious and include lots of big words and have that formal style that they think makes them sound smart. Instead, you want your unique “voice” to shine through. The trick is to write more like you talk. What tips would you most recommend for students? I always advise students to identify a handful (3-5) of the qualities that “define” them. These can be anything from creative, determined, leader, disciplined, laid-back, etc. Then start by picking one of those qualities and try to think of real-life examples from their recent past that show how or why they are this way. What you are looking for are moments or experiences you had that shaped who you are, how you think and what you care about. When you recount these “mini stories” or anecdotes in your essays, you reveal yourself in a natural way. The best stories contain some type of “problem” that you had to handle. The problem can be anything from terrible acne to making some type of mistake. They can also be a phobia, a life change, an obstacle, challenge or idiosyncrasy. The beauty of a problem is that you can tell the story of what happened, and then go on to describe how you dealt with it and what you learned. Before you know it, you have a terrific essay. What are the big essay mishaps that should be avoided? Many students work themselves into a panic over these essays. It just doesn’t help. And they also tell me they have nothing to write about, nothing makes them special. But I know this isn’t true. In fact, I have yet to find a student who put some energy into brainstorming and came up blank. Not one. Everyone has stories to tell. Also, even though the structure of a narrative essay is looser than a formal, academic essay, you still need a plan. It can be enough to just number the main points you want to cover in each paragraph to make sure your essay flows and makes sense. Whatever works for you. Don’t try to make it perfect in the first draft. Just pick a topic, find a story, jot down a rough outline or writing plan, and pound out a draft. Tell yourself you are just getting out your thoughts and ideas, and do not worry about grammar, spelling, those types of things. Then you can go back, read it out loud, take out the redundant or dull parts, move things around to make it flow better, and fix all the small stuff later. Another mistake is to write about a topic that the admissions folks will already learn about you from other parts of your application. If possible, tell them something they don’t know or wouldn’t discover about you elsewhere. Are there any essay topics that are more favorable than others? I think topics that allow students to “show their grit” are often the best. And these can be anything from major life crises to simple everyday challenges. The idea is that you share an experience where things didn’t go the way you wanted or expected, and how you handled it and thought about and felt and learned in the process. It’s not so much what you write about as what you have to say about the process. Pick a “small” subject and say something “big” about it. Works every time! What services or programs would you recommend for students who want to improve their essays? I think one of the best ways for students to find ideas for topics and also learn how to write in a narrative style is to read sample essays. You can see for yourself the range of topics that make great essays, and also study how the writers structured their essays. When you read other essays, see which ones you liked best—and try to emulate the techniques they used in your own. Learn to trust what moves you—stories, humor, emotion, humility, insights, etc.–and chances are, you can learn to move others the same way. If you feel totally stuck or think you can’t write, you could always hire a private tutor or find an essay-writing class. But I believe you can find plenty of help from online sources and books on essay writing. I do think those Web sites that offer to write essays for students are a total rip-off. For what it’s worth, some of the worst essays I’ve read were from students who had a lot of “help,” from counselors, parents and/or teachers. Although they meant well, these helpers often took all the life and color out the essays. The best essays were almost always from students who found a story and shared it in their own words. What was the best essay you’ve ever read? I can’t say there was one that I would call the “best” essay. They are so subjective. Off the top of my head, I loved one about a girl’s big hips, and another about a girl who took care of her dying dad, and one about collecting trash and another about driving between her divorced parent’s home each week. The topics are all over the place. But again, it’s more what the student had to say about his or her topic. The “best” essays are those that make me want to keep reading, and when I’m done, I have formed an opinion about the writer. If I feel like I know that person a little better, and respect how they feel and think about things (even if I don’t totally agree), then I believe they have done a good job with their essay. And if I feel like I like them and would want to know them better, then I would say they did a great job. And chances are, the college admissions officials who read that essay will feel the same way. The goal of these essays is to reveal a core part of who you are so that the colleges can get a sense of what makes you tick. I believe the main things they want to see are that you are engaged in the world, care deeply about whatever you do, have the maturity to be honest, open and introspective, love learning and can’t wait to learn more. Isn’t that the type of person you would want at your college? Oriana Halverson is a junior at a fairly large public school in western New York. She spends her days creating lists of things to do and competing in oratorical competitions such as the wonderful Model UN. In her very spare time, she takes naps and dances on vertical apparatuses.